Count on your slow cooker to deliver this comforting, deliciously herbed cross between a pilaf and a stew. Farro comes in “whole grain” or “pearled” versions. You can tell by examining the grains, pearled has had the bran layer partially scraped off. You can use either here, but if using pearled, subtract 30 minutes from the cooking time. 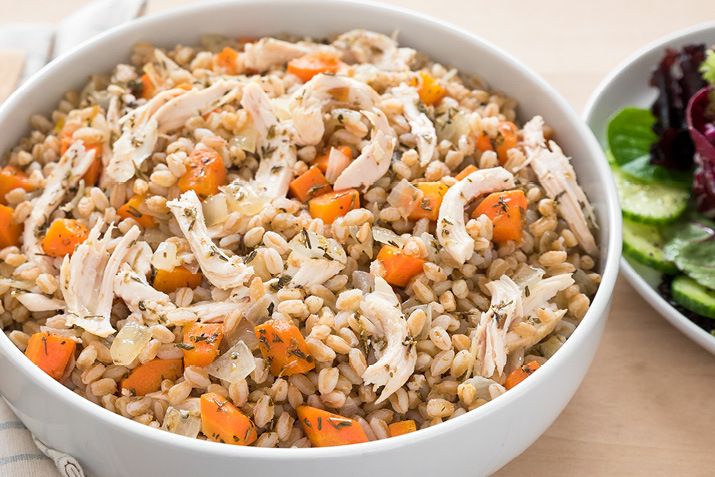 In the slow cooker, combine the farro, chicken stock, water, thyme, sage, salt, carrot and onion, and stir to mix. Place the chicken on top and put the lid on the pot. Cook on high for 4 hours for whole farro, 3 1/2 hours for pearled. When the farro is tender, take two forks and shred the chicken in the pot, then stir into the farro. Serve hot. Keeps, tightly covered, for 4 days in the refrigerator. This hearty dish is flexible. Add chopped celery, fennel, rutabaga or other root vegetables you may have. Garnish the final dish with chopped parsley for a pop of color and a bright, fresh flavor.